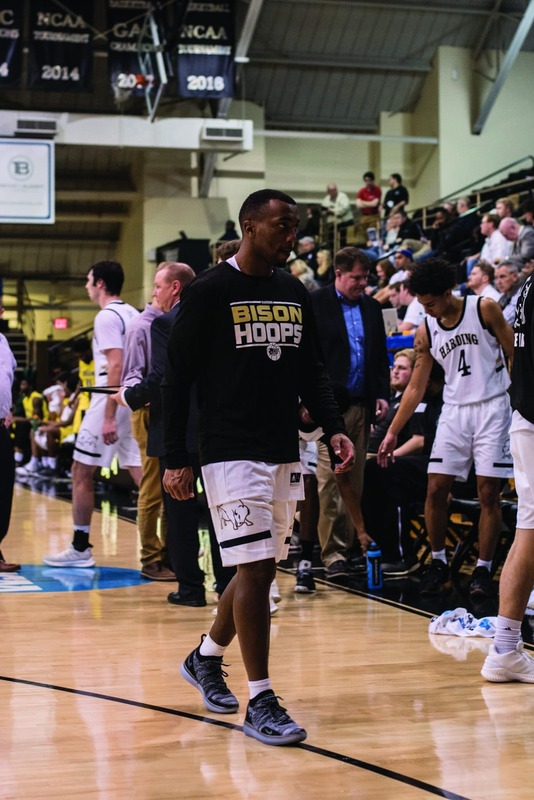 Senior Tony Becton played a key role in the Harding football’s success in recent years, but after finishing his senior season on the field, Becton decided to take his talents to the court. Men’s Head Basketball Coach Jeff Morgan said this is the first time in Harding sports history that a player has transitioned from football to basketball. Becton participated in basketball, football and track in high school. His senior year, he realized he had the best chance of getting a scholarship for football and decided to pursue it instead, but still kept his love for basketball. Offensive Coordinator Chris Hill credits Becton’s athleticism as the reason he was able to make the men’s squad. Becton has shown his dynamic abilities on both defense and special teams during his time playing for the Bison football team. Becton recorded 39 tackles on the defensive end and had 15 punt returns for over 85 yards. Despite his overall athleticism, Becton says the transition has been a difficult one, considering he has not played competitive basketball in over six years. After fighting through an ankle injury and getting some more practices under his belt, Becton said he is learning the system and plays, and everything is coming together for him now. While Becton’s athletic abilities have impressed his coaches, both Morgan and Hill sang higher praises of his role as a teammate. Morgan said the other players love him and Becton has done a great job investing in his new teammates. He added Becton’s energy at practice and locker room presence have brought a new, positive energy to the entire team. Becton is not expected to play significant minutes for the Bisons this season, but his coaches hope his athleticism and locker room presence will help lead the Bisons to more wins this season.